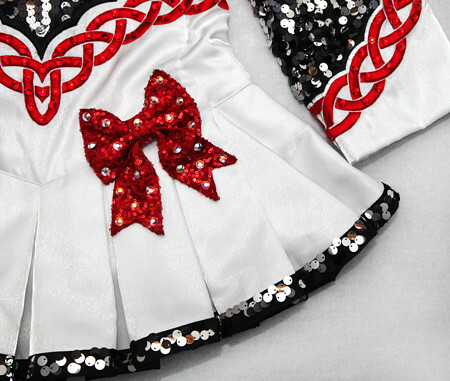 Centre front neck to dropped waist: 21"
Centre back neck to dropped waist: 20"
Centre back dropped waist to hem: 10¼"
White twinkle satin bodice with classic bright red Celtic embroidered faux waist belt. 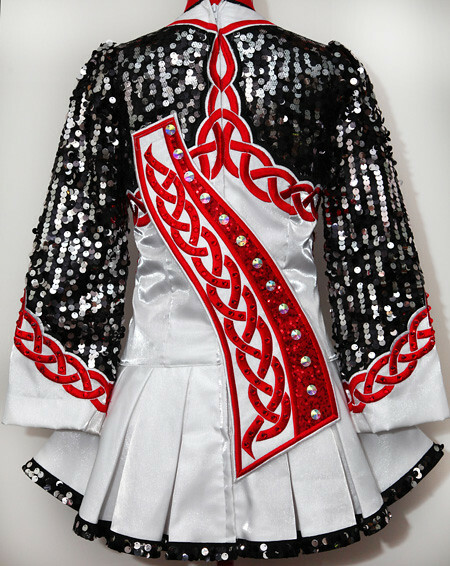 Black and silver spangle sequin sleeves and shoulder yokes in the modern bolero style with matching red Celtic embroidery on the sleeve cuffs. Modern style wave skirt constructed from white twinkle satin. Red sequin bow at left side of dropped waist point. Beautifully embroidered stiff asymmetrical shawl with matching embroidery. Red and white stripe underskirt lining. Matching bloomers and red sequin headband with Swarovski crystals. Hundreds of red and crystal AB Swarovski crystals in various shapes and sizes for added sparkle. Ample seam allowances will allow for alterations if needed. Immaculate condition. Made in August 2012. Worn TWICE only.